Make brownie batter as directed on box for cakelike brownies. Stir in 1 cup of the chopped cookies. Spread in pan. Bake 24 to 26 minutes or until toothpick inserted 2 inches from side comes out almost clean. Cool completely, about 1 hour. In large bowl, beat dry pudding mixes and milk with whisk about 2 minutes or until thick. Stir in 1 cup whipped topping, the food color and peppermint extract. Stir in 2 cups of the chopped cookies. Spread over brownie. Drop remaining whipped topping by spoonfuls over pudding layer; spread evenly. Refrigerate 4 hours. When ready to serve, sprinkle remaining cookies on top. Cut into 6 rows by 4 rows. Cover and refrigerate any remaining pieces. For best results and easy cutting, be sure to refrigerate at least 4 hours. Roughly chopping the sandwich cookies by hand gives the best texture. If you’re in a rush, place cookies in a zip-top plastic bag, and crush by going over with a rolling pin a few times. Grasshopper flavor began with the iconic cocktail, which is made with cream, crème de menthe and white crème de cacao. It’s a sweet drink and accordingly was served as a dessert cocktail. “Grasshopper” refers to the bright green color of the drink. Grasshopper pie was inspired by the cocktail. Typically, grasshopper pie includes a no-bake crust of crushed chocolate wafer cookies and a cold, creamy filling made of marshmallows, crème de menthe and crème de cacao—among other sweet ingredients. Lushes, sometimes called dessert lasagnas, are decadent chilled treats that feature several sweet layers. 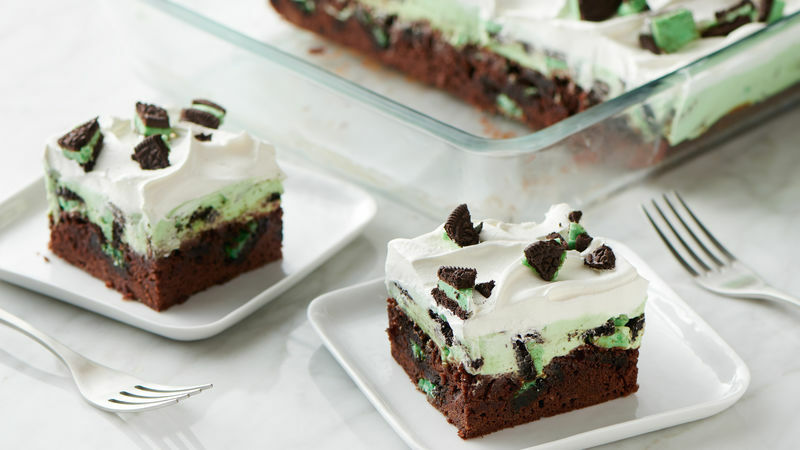 Usually the base of a lush is made of cookies or brownies while layers often include pudding, whipped cream, cream cheese and other rich and creamy ingredients. With their pretty layers and crowd-friendly sizing (our recipes are all made in 13x9-inch pans), lushes are perfect for a party!